Conversely, if you don’t have the variant it doesn’t mean you are free of risk. Your genetic risk for these conditions is but one of many factors, such as lifestyle, environment and family history, that play a role. (As with any test, it is also possible to receive a “Not Determined” result. This is rare, and can be caused by random test error or other factors that interfere with the test. 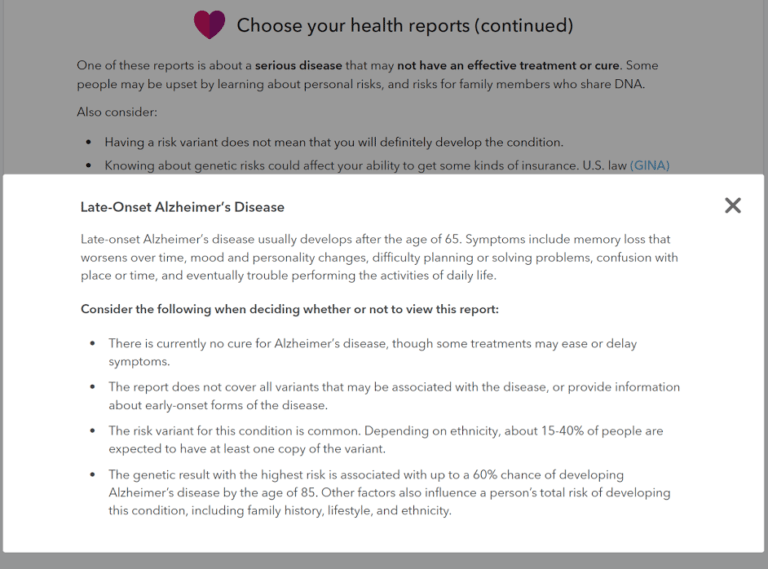 )Another important aspect of these reports is that 23andMe doesn’t test for all the possible genetic variants that could influence risk for these conditions. 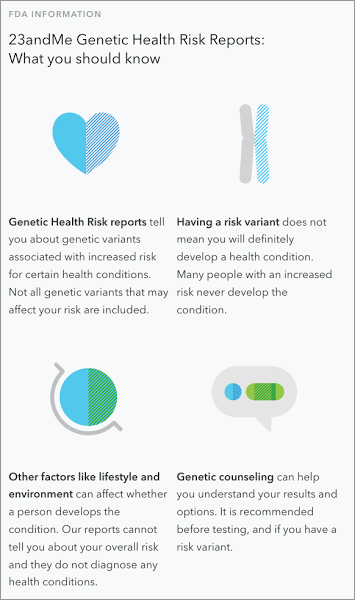 Even if a person’s report says that no variants were detected, that person could still have a variant not covered by the test that may affect risk for the condition. 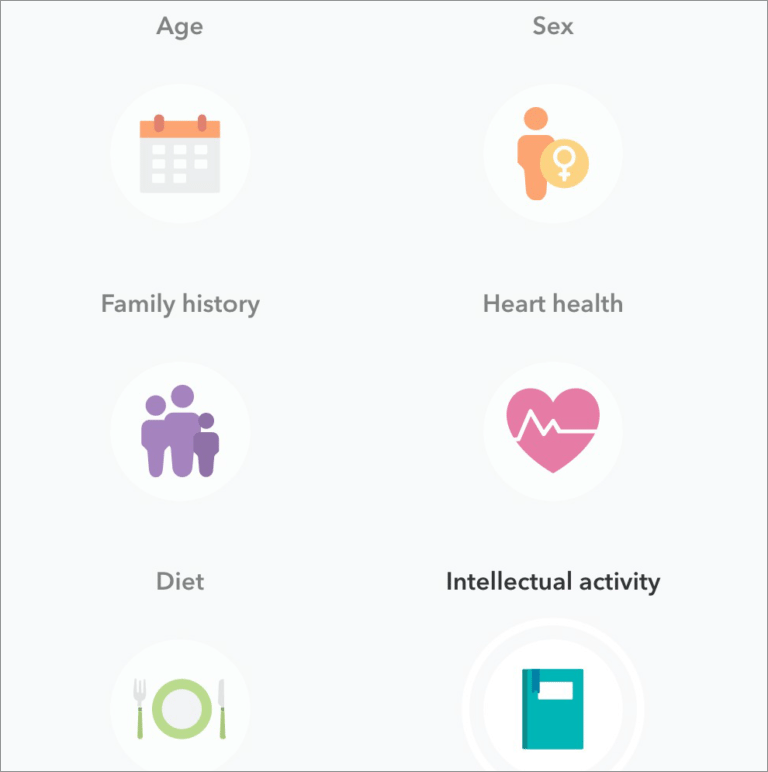 23andMe’s reports include only variants that can be detected and validated on our genotyping chip, and the reports do not include many rare variants not available on our chip or variants that have not yet been discovered. 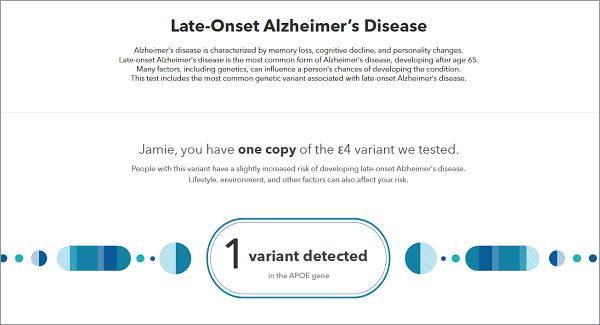 The Overview page summarizes a person’s result, such as the number of variants detected and whether this is associated with increased risk, and provides brief but important points for understanding what the result means. This page also includes important information about what the test does and doesn’t do, and how a person’s ethnicity may matter. More information about the condition, including how common it is, typical signs and symptoms, and other risk factors are also highlighted. Many of these sections provide links to the Scientific Details page where customers can find more information and supporting references. The Overview page also provides quick links to genetic counseling, frequently asked questions, and printing to share with a healthcare professional. In the Scientific Details page you’ll find more information about the genes and variants tested, health risk estimates associated with those variants in different populations, and clinical and analytical performance of the test. There will also be detailed information about other factors that influence whether a person develops the condition. All scientific references supporting the information in the report are provided at the bottom of this page. All types of risk estimates are applicable only to the populations or ethnicities specified in each report, though people of other ethnicities can view the information for educational purposes.An important aspect to understand about risk estimates is that, being estimates, they have some amount of uncertainty. This is often conveyed using a “confidence interval,” which shows the range of possible likely values for that risk estimate. The wider that range, the less certain the specific risk estimate is. The confidence intervals for risk estimates based on published studies can be found in the references for those studies. 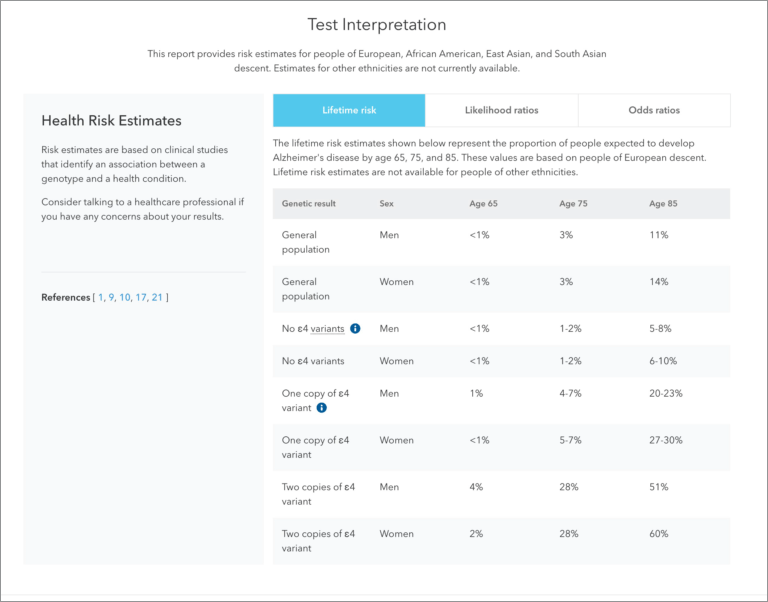 The confidence intervals for risk estimates calculated by 23andMe can be found by clicking the button “See 95 percent confidence intervals” underneath those risk tables. 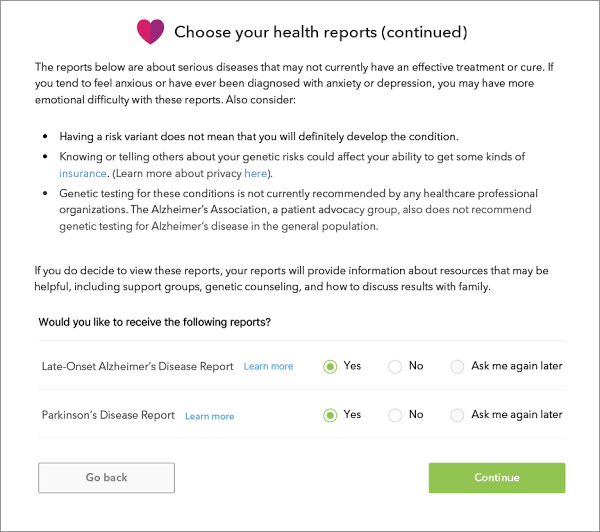 We strive to help our customers get the most out of their experience, and so each Genetic Health Risk report includes Frequently Asked Questions tailored to each customer’s results, in addition to our Customer Care center which is always available.While 23andMe Genetic Health Risk reports do not diagnose diseases or conditions, they do include potentially important information that you could use to help be more proactive about your health and engage in your own wellness. That may also include talking to your doctor, a genetic counselor or other health professional. Genetic counselors in particular are well-suited to help people who have questions about genetic risks and genetic testing. If you have specific questions or concerns about your health, we encourage you to contact a healthcare professional.